LuaConf is a one-day single-track international conference focused on the Lua programming language. 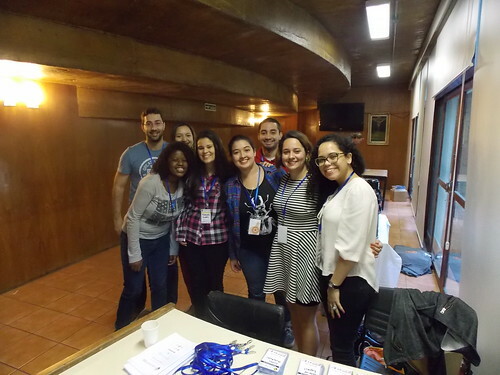 Even though Lua was created in Brazil, since 2010 the Lua workshop has been held in foreign countries. It is time a local conference is held and, for this reason, LuaConf was created. Last year, LuaConf was a huge success. We gathered speakers and attendees from all over the world with high quality technical content. The goal of this event is to promote the Lua language, promote Brazilian technology and innovation and get Lua developers together. How much does a feature cost in a programming language? Frequently, when people propose new features for a software, the most common metric is lines of code. If a feature can be implemented in a few lines, why not add it? However, each feature has several hidden costs. Besides performance, features can have costs in documentation and testing. Some impair the conceptual integrity of the language, making it more difficult to learn. Some restrict alternative implementations. Some hinder its evolution, by narrowing unnecessarily the design space. In this talk, we will discuss these and other costs of adding features to a language, illustrating the discussion with several features already present in Lua. Nessa palestra usamos o jogo Warlock's Tower, vencedor do SBGames 2015 nas categorias "Melhor Game Design" e "Melhor Jogo em Desenvolvimento", como ponto de partida para falar sobre a criação de jogos em Lua. Discutiremos as opções atuais de engines e frameworks, visando tanto o desenvolvedor de jogos experiente como o iniciante, e apresentaremos questões cruciais de implementação, tanto específicas ao nosso projeto (Que bibliotecas usamos? Como é fazer um jogo retrô? Como fazer um jogo integrado ao Twitch?) como as que se aplicam a qualquer jogo feito nessa linguagem. Uma palestra para aqueles que querem conhecer os detalhes suculentos de como fizemos esse jogo, ou para aqueles que simplesmente querem começar a fazer os seus próprios jogos, usando Lua. In this talk, we'll look at pros and cons of using Lua as the main language in your programs, and share some tips on how to do it effectively. Lua vem sendo amplamente utilizada em aplicações de código aberto voltadas para Segurança da Informação (SI), como, por exemplo, Nmap, Snort, Wireshark, ModSecurity. Nesta apresentação, mostraremos como Lua vem sendo utilizada nos produtos de duas companhias de SI: Zenedge e CUJO. A Zenedge oferece serviço de prevenção e mitigação de ataques de Distributed Denial of Service (DDoS) e de Web Application Firewall (WAF). Para isso, ela utiliza Openresty com scripts Lua para controle de acesso, detecção de bots e eliminação de falso-positivos baseado em aprendizado de máquina. A CUJO oferece serviço de proteção de redes domésticas através de um dispositivo embutido. Para isso, ela utiliza scripts Lua para orquestração de ações do dispositivo, controle de acesso e inspeção de tráfego. Depois de sermos apresentados a todas as facilidades que linguagens modernas de programação nos oferecem, não estamos mais dispostos a encarar uma linguagem baixo nível, como C, para alcançar o auge do desempenho. Para linguagens imperativas de tipagem estática, a literatura disponível é bem generosa quando se trata de otimizações. Contudo, o processo de criar um compilador de alto desempenho para linguagens dinâmicas é extremamente complexo. Nessa palestra pretendo dar uma visão geral de como compiladores JIT funcionam, com foco especial em Lua. Irei abordar LuaJIT, que já é bem estabelecido, e também alternativas recentes: Terra, Ravi e Lua Vermelha. Por fim, comentarei os principais desafios que esbarrei ao implementar o FastLua, mais um compilador JIT para Lua. This talk involves a quick introduction to the interoperability features of the Go language runtime and a walkthrough of an open source Go project that implements support for Lua middleware. A critical component of the Kong API Gateway, the lua-cassandra library originated from the Lua community, and is now being actively maintained by Mashape. We will study its story, its new features such as clustering support, good practices for LuaJIT/OpenResty development, and propose some solutions to the difficulties of maintaining Lua code for PUC-Lua, LuaJIT, and OpenResty. O desenvolvimento de jogos para dispositivos móveis está crescendo cada vez mais rápido, em especial jogos 2d. Existem diversas linguagens e plataformas para desenvolver um jogo 2d no seu smartphone, mas sem dúvida uma das mais simples e bastante utilizadas é a linguagem Lua. O mais interessante é que Lua é utilizada no mundo inteiro mas é uma linguagem 100% brasileira! Sim, ela foi criada no Brasil! E nessa palestra falaremos sobre o desenvolvimento de jogos mobiles utilizando a linguagem LUA. Em várias áreas da Informática há demanda por métodos formais para validação de sistemas, objetivo para o qual existem diversas técnicas diferentes a ser aplicadas. A Dedução Natural (ND) é um dos procedimentos de provas de sentenças lógicas que busca aproximar-se do processo pelo qual um ser humano seguiria para realizar tal prova. Nessa apresentação mostrarei meu Provador Automatizado de Teoremas (ATP) baseado numa estrutura interna de grafos que realiza provas utilizando a ND, feito em Lua, com o objetivo de mostrar uma área não muito usual na qual Lua pode ser utilizada, explicitando a versatilidade da linguagem. In several areas of Informatics there is a need for system validation via formal methods, in which several different techniques can be applied. Natural Deduction (ND) is one of the logic sentence proving methods which aims to approximate itself to the expected process by which a human being would think in order to construct such proof. In this talk I will show my Automated Theorem Prover (ATP) based in a internal structure of graphs which utilizes ND, made in Lua, to show a not very usual area in which Lua can be utilized, show how versatile the language can be. Mashape will share their lessons learned on building their Kong API gateway which recently turned 2. The gateway is built on OpenResty/Nginx and uses the LuaJIT engine. Nessa palestra vamos mostrar o caminho das pedras para a utilização de Lua em placas de prototipação de baixo custo para o desenvolvimento de aplicações para a Internet das Coisas ao investigarmos a realização de um projeto completo de uma máquina de criação de drinks. Ao final da palestra, os espectadores terão o conhecimento necessário sobre como começar seus prórios projetos e onde buscar mais informações sobre o assunto. The performace explores the simplicity and the minimal design of Lua in a musical context, manipulating Lua code as an instrument. The only data structure, the table, is used to generate MIDI scores on-the-fly and sending them to audio generators also written in Lua. The audio-reactive visual content will be live coded in the browser with the same language. The main goal is to demonstrate how Lua is an interesting language for digital creative processes. Become a sponsor at LuaConf! LuaConf is dedicated to providing a harassment-free conference experience for everyone, regardless of gender, gender identity and expression, age, sexual orientation, disability, physical appearance, body size, race, ethnicity, religion (or lack thereof), or technology choices. We do not tolerate harassment of conference participants in any form. Sexual language and imagery is not appropriate for any conference venue, including talks, workshops, parties, Twitter and other online media. LuaConf participants violating these rules may be sanctioned or expelled from LuaConf without a refund at the discretion of the conference organisers. All attendees, speakers, sponsors and volunteers at LuaConf are required to agree with the following code of conduct. Organisers will enforce this code throughout the event. We expect cooperation from all participants to help ensure a safe environment for everybody. If a participant engages in harassing behavior, LuaConf organisers may take any action they deem appropriate, including warning the offender or expulsion from LuaConf with no refund. If you are being harassed, notice that someone else is being harassed, or have any other concerns, please contact a member of LuaConf staff immediately. LuaConf's staff can be identified as they'll be wearing branded t-shirts. LuaConf's staff will be happy to help participants contact venue security or local law enforcement, provide escorts, or otherwise assist those experiencing harassment to feel safe for the duration of LuaConf. We value your attendance. We expect participants to follow these rules at LuaConf and workshop venues and our conference-related social events. Rua Marquês de São Vicente, 225, Rio Datacentro - 22451-900.